Heat gas or charcoal grill. In small bowl, mix teriyaki sauce, sesame seed and ginger. Carefully brush grill rack with vegetable oil. Place chicken on grill rack over medium heat. Cover grill; cook 15 to 20 minutes, brushing frequently with sauce mixture and turning after 10 minutes, until juice of chicken is clear when center of thickest part is cut (170°F). Discard any remaining sauce mixture. To toast sesame seed, heat in ungreased skillet over medium heat about 2 minutes, stirring occasionally, until golden brown. 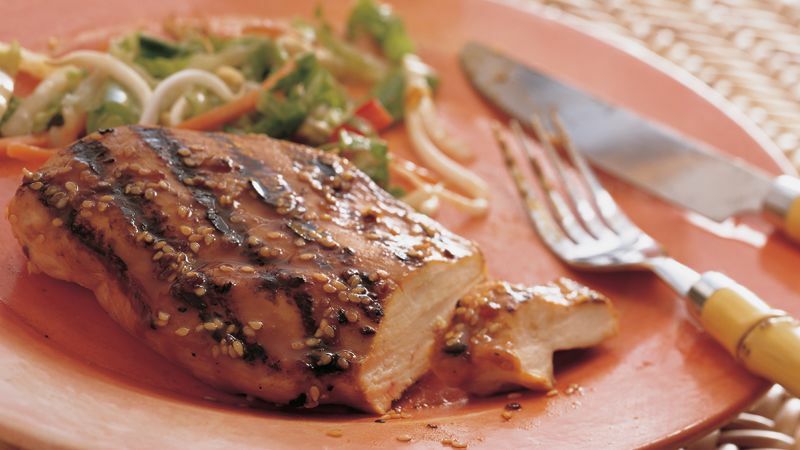 To retain the juices, turn chicken with tongs instead of piercing it with a fork. For a really easy meal, add warm egg rolls and an Asian salad from the deli. Any flavor of sherbet would be the perfect refreshing dessert.